Baggie Puppet, Apron, and Swing Trash Can Lady!!! Plus a few SURPRISE bonus files are included!!! 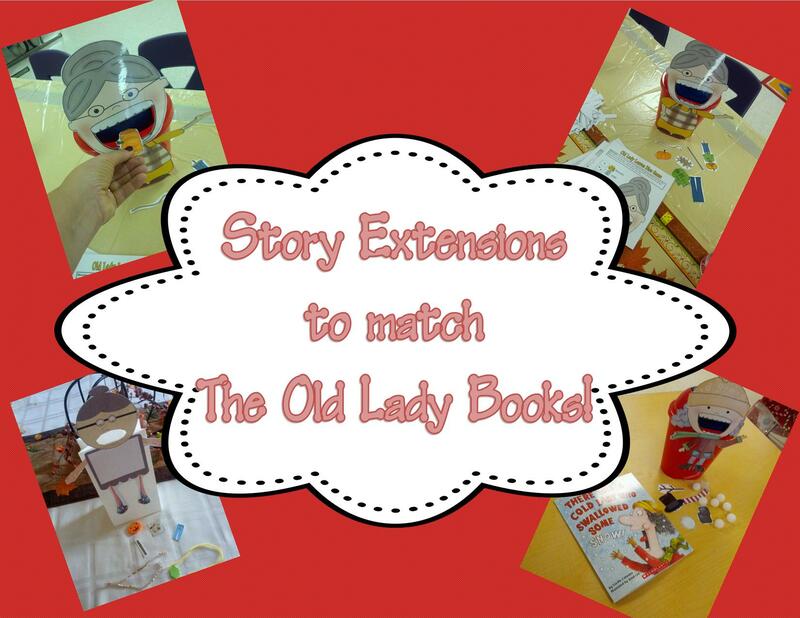 Have students create an Old Lady that they can use to act out any "Old Lady Story." 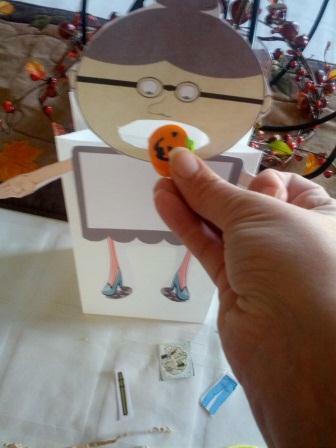 Use a ziploc baggie or a white paper bag for the belly and have the students draw the pictures of the items the lady swallowed in the book. Or use tangible items. 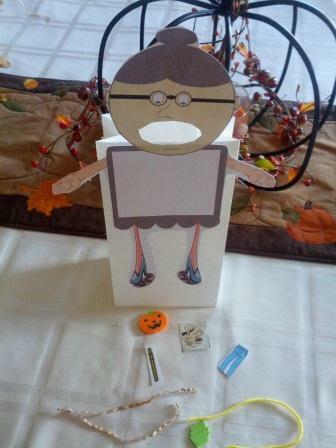 For instance, in the story, There Was an Old Lady who Swallowed some Leaves, I used string for the rope, a pumpkin eraser for the eraser, and pieces of brown filler for the straw. (BE CREATIVE)! The students love to use the puppet to retell the story to their classmates. When we are done with the puppets in class, I let the kids take home their own Old Lady to retell the story to a parent at home. THEY LOVE HAVING THEIR OWN OLD LADY!!! The packet has a printable lady you can use to put on the ziploc or lunch bag. The packet also contains a pattern to make a LARGE Old Lady Apron. The Old Lady Baggie Pattern Could Be Used With Any Of The Old Lady Books! Below are more titles you could use the Old Lady Baggie Pattern or Apron with!! Also has files to create an Old Lady Swing Trash Can (Similar to a sound muncher and can even be used as that as well)! Isn't she so cute? There are two versions of this lady. You can make one with winter attire or one plain old lady as seen above. I use the swim trash cans from the dolla store. Print and laminate pieces. Cut. I cut the inside of the mouth as seen. Use a glue gun to glue the head to the swing trash can. Lastly glue the body onto the bottom of the can. The kids love to see the Cold Lady and love that her mouth opens and shuts with a push of the inside of the mouth. 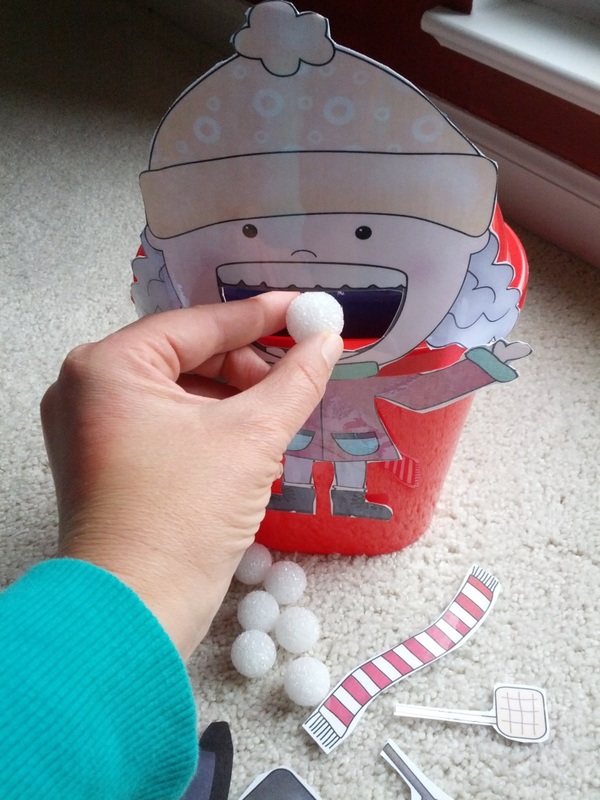 In the packet, I share how I use the swing top trash can old lady in my classroom. 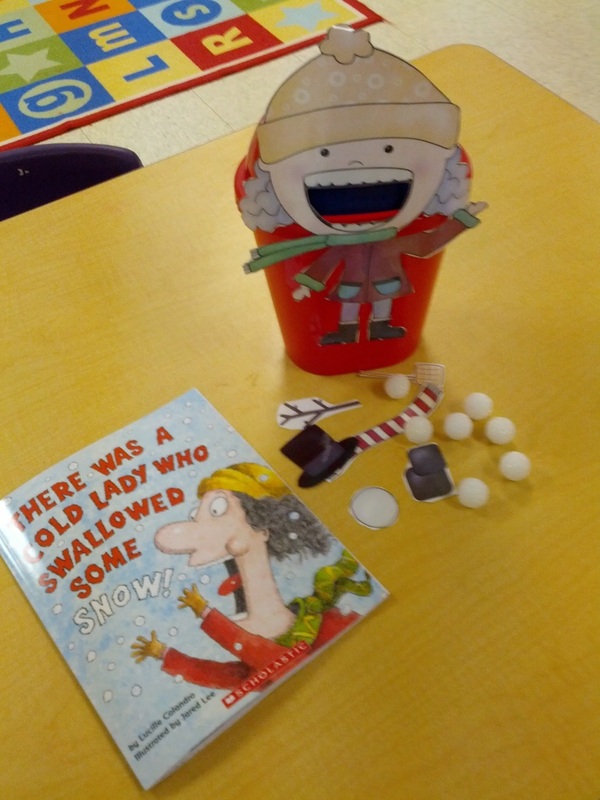 The file with the old lady trash can template also has pieces to use with the stories, There Was An Old Lady Who Swallowed Some Leaves!, There Was an Old Lady Who Swallowed Some Books!, and There Was a Cold Lady Who Swallowed Some Snow! 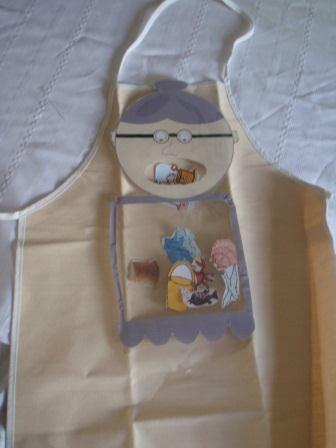 Also make an apron with the Old Lady Beach (or any Old Lady Story) to retell the story. My apron is below. The kids can put it on and place items the lady eats in the mouth. 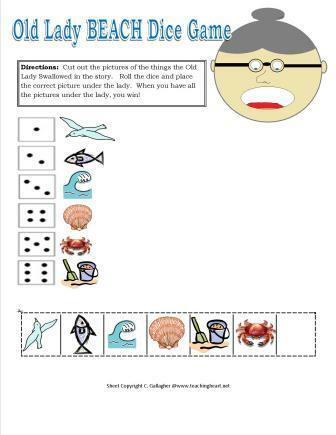 They love this and it is a great way to get kids retelling. TIP: After they feed the Old LAdy all the items, I like to have her spit out the final product like she does at the end of all the book. So, if you were reading There Was an Old LAdy That Swallowed Some Snow - throw a stuffed snowman into the laps of your audience. Or if you are feeding the lady items from There Was An Old Lady who Swallowed Some Leaves, throw a scarecrow at them. They really love this surprise. You can purchase child aprons at Michael's craft store. Also included are many Old Lady Dice Games to match the books!